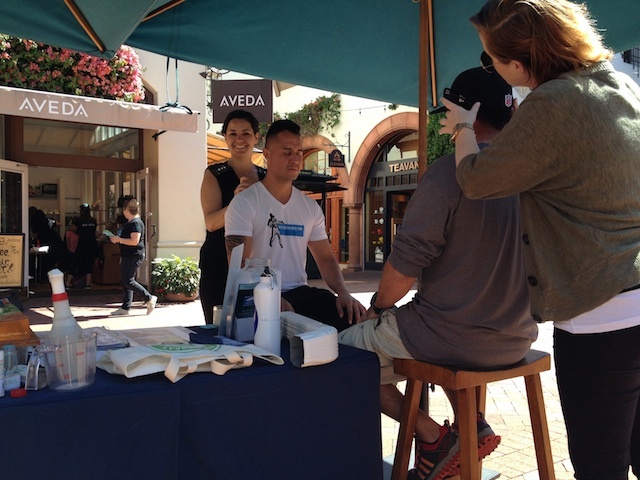 For the 8th year, Aveda hair and body care company is raising money for Surfrider! In the past 7 years, Aveda salons and Experience Centers have raised over $750,000 for Surfrider's Clean Water Program (of which the Ocean Friendly Gardens Program is a part). Aveda's mission is in line with Surfrider's: "Care for the world we live in, from the products we make to the ways in which we give back to society. At Aveda, we strive to set an example." During the month of March, Surfrider staff present a short talk at Aveda salons and Centers to educate Aveda crew (volunteer activists presented a few, too). Melissa McLaughlin (pictured above), Salon Development Partner for the Pacific Southwest, brainstorms with the Aveda crew about what fundraising activities they want to do: cut-a-thon (haircuts, massages), raffle basket, bake sale, makeup application, and more. 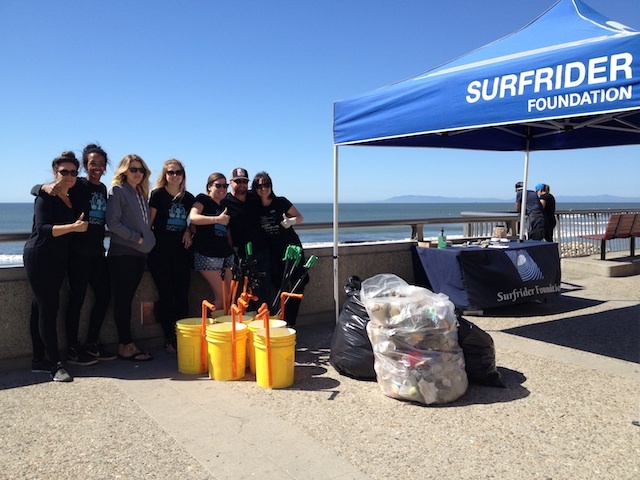 Beach clean-up are also a part of Aveda Earth Month, and Surfrider staff lead them. Sometimes the salons and Centers collaborate, such as the clean-up in Ventura, CA that netted 83 pounds (at right). Tangerenz salon owner, Gavin Skill, is an experienced trash collector: he brought trash grabbers and back-saving buckets with built-in handles (bright yellow ones, pictured at right). 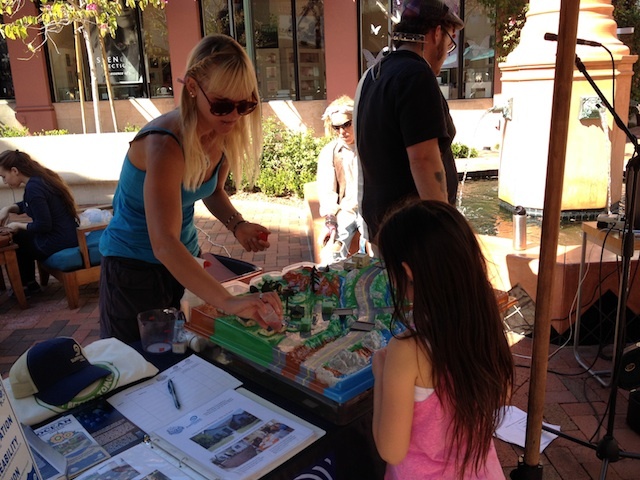 Surfrider-Santa Barbara Chapter Volunteer Coordinator, Kalyn Noe, used a model of a watershed to show a girl how polluted runoff happens and how to prevent it. Kalyn teaches at Santa Barbara High School, which is home to an Ocean Friendly Garden. At a grand re-opening party for Tangerenz Salon, Gavin and a stylist named Mary did their owner educating about how much water is used on everyday items (at left). A pair of jeans uses 1,800 gallons. A bag of M&Ms: 304 gallons. A (plastic) bottle of water: 1.85 gallons. Tanerenz has been given a number of awards for their work, and Gavin wants to find an aerator for his hair washing stations (let him know if you find one). Gavin is also wanting to take his message to the streets: after hearing about a parkway curb cut a few blocks-away, he wants to do one in front of his store. The Surfrider-Ventura County Chapter has heard of Gavin's interest and is going to follow up. Thanks to all the Aveda salons and Centers for your fundraising, beach cleaning-up and educating your guests! If you need a haircut, massage, or hair and body products, check out an Aveda salon using this directory.